CollectPlus, operating as Collect+, is a joint venture between Yodel and PayPoint. It enables customers to pick up online purchases and return items to online and catalogue retailers. In addition to in-store pick-up and drop-off, CollectPlus also offers door-to-door deliveries within the United Kingdom. The UK-based company provides a simple pricing structure for businesses and individuals to send parcels to and from CollectPlus outlets, which are typically open seven days a week with extended operating hours for maximum flexibility. All CollectPlus services are fully tracked. Items can be tracked online (www.collectplus.co.uk/track) using the company’s tracking tool. A tracking number is provided by a retailer when purchasing an item. When sending a personal parcel, a tracking number will be provided by CollectPlus on the proof of postage receipt in stores or on an order confirmation email when purchasing shipping online. 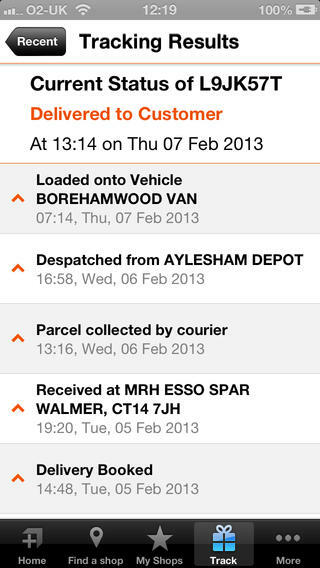 The company’s tracking system outlines key events as a parcel moves through the CollectPlus network. The reference number is between seven and 16 characters and includes letters and numbers. For Standard Service, parcels are collected and routed to CollectPlus’s National Hub centre during the first business day. Overnight, the parcel is sorted and rerouted to its destination. The parcel is delivered by Yodel to the recipient on the second business day. For example, if a parcel is dropped off at a shop on Monday, the item will be delivered by Wednesday. Deliveries to non-mainland addresses, including destinations in the Channel Islands, the Scottish Highlands and Islands, the Isles of Scilly and the Isle of Man, may take up to five extra business days to arrive. Time-specific delivery is not currently offered by CollectPlus. For returns and Economy Service for sending parcels, parcels are collected and routed to the National Hub centre during the first 3 business days. Sorting and routing to the parcel’s destination takes place between the second and fourth business day, while delivery by Yodel takes place in three to five working days. For example, if an item is dropped off at a shop on Monday, the parcel will be delivered to its destination between Thursday and the following Monday. Deliveries to non-mainland addresses may take up to five business days longer. For Click & Collect, parcels are delivered to a specific CollectPlus outlet at the time specified by the customer when an online purchase is made with a retailer. Typically, the item will still be sorted and routed through the National Hub centre. The amount of time the parcel takes to go through the CollectPlus network will depend on the date and time selected for delivery. CollectPlus provides three main services for online shopping and selling. All parcels are covered for up to £50 at no extra charge. Additional cover can be purchased at £3 for £150 cover and £5 for £300 cover. CollectPlus allows customers to send and receive a range of goods, although certain items such as glass, money, hazardous goods, artwork, ceramics and liquids are prohibited. Maximum dimensions for all parcels sent with CollectPlus are 60 centimetres by 50 centimetres by 50 centimetres. Only parcels weighting up to 10 kilograms are accepted by CollectPlus. For selling online or to send a personal parcel to friends and family, CollectPlus offers its Send delivery service within the United Kingdom. To send a parcel, customers buy and print a shipping label online from CollectPlus or at a CollectPlus store. After attaching the label to the parcel, the item is dropped off at a local CollectPlus store before it is transported by Yodel. The cost of shipping a parcel will depend on the weight of the item and service level. CollectPlus Tracked parcel delivery is also offered as an option for purchases made on eBay UK. This allows sellers to easily print shipping labels from the ‘Sold Items’ section under My eBay. Parcels are then dropped off at CollectPlus stores. CollectPlus’s Economy Service delivers an item to most destinations within the United Kingdom in three to five working days. 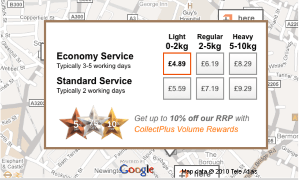 As of 2014, the service is available for £4.89 for Light parcels weighting up to two kilograms, £6.19 for Regular parcels weighting between two and five kilograms and £8.29 for Heavy parcels weighting between five and ten kilograms. For delivery within two working days, a Standard Service is available at £5.59 for Light parcels, £7.19 for Regular parcels and £9.29 for Heavy parcels. In addition to delivery to a CollectPlus store, a parcel may also be delivered to the recipient’s door in certain areas. If available, this option will be identified when purchasing a parcel label. Light parcels are typically sufficient for smaller items such as light articles of clothing including shirts, as well as DVDs, CDs and small electronics such as flashlights and MP3 players. A Regular parcel is typically needed for heavier articles of clothing, such as a coat or footwear, as well as toys and larger electronic devices such as power tools. Heavy parcels typically will be needed for large and bulky items, for example multiple books, sports equipment, kitchenware and large recreational items such as tents and camping gear. To return parcels to more than 260 online and catalogue retailers, CollectPlus offers its Return service. Customers simply affix a CollectPlus label to the package and drop the parcel off at a local CollectPlus store. Labels can be printed online by choosing a retailer from CollectPlus’s website and booking a return with the retailer. Once a return has been arranged, customers simply drop off their parcel at a local CollectPlus store. Proof of postage is provided when a return is made. The Click & Collect service allows customers to buy goods online and collect purchases from a local CollectPlus store at a specific date and time rather than wait for it to be delivered to their home address. This allows shoppers buying products from over 30 brands to choose a convenient time and location to retrieve their online shopping. The date and time is selected at the time the purchase is made. Items may be collected from one of over 5,500 CollectPlus locations across the United Kingdom. Deliveries to a CollectPlus store are typically between 7 a.m. and 9 p.m. Generally, parcels must be picked up within ten days. To collect a parcel, the recipient must provide identification. Identification might include a valid passport, a cheque book, a utility bill, a driving licence, a credit or debit card, or a bank or building society book. The name on the identification must match the name used for the online purchase. The pick-up code associated with the CollectPlus parcel must also be provided to the representative at the pick-up location. Collect+ is working with a big variety of brands and companies all over the United Kingdom. Online Shopping revolutionized the shopping behavior of people and the easy return policy came into be. Customers buying from Chums can use Collect+ Services, to have their return parcel collected free of charge. The individual has to just visit the Chums Returns website and type in the order number and an email address, accept terms and conditions. After that Colelct+ will email the return label to the provided e-mail address and you can use that label to return your goods conveniently and free of charge to Chums. Returning your set top box to Virgin has never been easier. Thanks to the cooperation between Collect+ and Virgin Media, it is possible to get a free return label for your shipment. You are asked to put the set top including all cable in the box. After you have finished creating the free return label, just put the printed label atop of the old one on the box. After you have finished these steps, just drop the parcel in one of the 5,500 local stores of Collect+! For users who regularly ship parcels, CollectPlus provides an option for creating an account. A CollectPlus account allows users to buy parcel labels and track parcels in one convenient place on CollectPlus’s website. Users can also save parcel details to avoid having to retype address information. Account holders also receive benefits, such as ten per cent off for referring friends. CollectPlus accounts can also be linked with eBay accounts. Linked accounts allow users to download address details for all items sold on eBay that are awaiting shipment. Login details are not shared between eBay and CollectPlus. eBay users can also select CollectPlus as a delivery option when listing items, allowing buyers to select CollectPlus Tracked as a carrier option when making a purchase. CollectPlus offers a reward scheme for Economy and Standard parcel delivery services when labels are purchased on the company’s website. A CollectPlus account is not required to qualify for discounts, although an account allows users to see what level of discount they qualify for. A contract is also not required in order to qualify for volume reward discounts. If users buy 50 parcel labels or more each month, they automatically quality for a volume reward and a discount of between five and ten per cent on all labels purchased from the website during the following month. A five per cent discount is available when buying 50 or more labels, 7.5 per cent for 100 parcel labels or more, and ten per cent when buying 150 parcel labels or more in a month. In order to buy a parcel label, visit CollectPlus’s homepage and simply enter a valid UK post code to begin. Users can then type the recipient’s name and address information before choosing Economy or Standard service and the weight of the parcel. Users can also choose the level of cover and request proof of delivery. Requiring a signature when the parcel is delivered is only available for an extra £1 for standard coverage and free when additional cover is purchased. A valid email address is required when purchasing a parcel label. The parcel label is then available as a PDF document in order to print and affix to the item before it is dropped off at a CollectPlus store. To find a CollectPlus store, visit www.collectplus.co.uk/orders/new. A valid post code is needed to find a nearby store. Search results will provide address information and operating hours for local CollectPlus stores, as well as quick links to arrange a return or to send a parcel from the store. The CollectPlus mobile app for iPhone and Android mobile devices allow users to find local shops by location or post code. Users can view results on a map of the local area or as a list, as well as confirm the address and opening hours or get directions to the shop from their current location. The free app also provides users with the ability to track parcels and set their favourite shop for future reference. CollectPlus is the largest store-based parcel delivery and returns service in the United Kingdom. 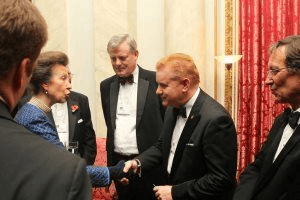 Launched in 2009, the company was set up as a rival to the Post Office, a subsidiary of the Royal Mail Group. Branded as Collect+, the company allows individuals and businesses to send parcels through local shops. CollectPlus was launched as a joint venture with Yodel, a parcel delivery company formerly known as the Home Delivery Network. Yodel was formed in 2010 when the Home Delivery Network took over DHL’s domestic business operations in the United Kingdom. By 2011, CollectPlus operated in approximately 3,500 local shops that were part of the PayPoint network of stores. Originally launched in Northern Ireland in 1996, PayPoint offers a system for paying bills in the United Kingdom and Ireland. It was first used for paying bills for utility and media companies, including British Gas, Vodafone, Orange and Scottish Power. In addition to Yodel, PayPoint is a founded member of the CollectPlus joint venture. Today, the CollectPlus’s store network includes more than 5,500 newsagents, supermarkets, convenience shops, and petrol stations throughout England, Scotland, Wales and Northern Ireland. Stores are located in most towns and cities, with hundreds of locations in Greater London alone. According to CollectPlus, about 90 per cent of people in living in towns and cities across the UK are within a mile of a CollectPlus store. CollectPlus partners with over 260 brands to help make online shopping easy with local and accessible places to collect online purchases and return unwanted items. This allows e-retail and catalogue customers make convenient pick-ups and drop-offs from locations close to home or work, including locations at ASDA, Costcutter, McColl’s, Nisa and SPAR branches. Major CollectPlus retail partners include Amazon, ASDA Direct, Clarks, Dorothy Perkins, House of Fraser, JD Sports, M&S, New Look, Topman, Topshop, Virgin Media, and Republic. In order to provide its easy pick-up and drop-off service for online retailers, CollectPlus is partnered with Yodel for parcel delivery throughout the United Kingdom. Yodel is a leading UK parcel delivery service, handling more than 135 million parcels every year. The company also partners with Parcel Motel for international returns for shoppers in Ireland. CollectPlus also works with PayPoint, an international provider of payments and value added services for the retail businesses and companies in other sectors. Each year, PayPoint handles over £14 billion from 750 million transactions for over 6,000 clients and merchants. Bar-coded shipping labels and other electronic files are created in partnership with NetDispatch, which provides its services to more than 120,000 e-retailers, catalogue companies, manufacturers, service businesses and eBay sellers around the world. Although operating as CollectPlus or Collect+, the company’s legal business name is Drop and Collect Ltd. The company is based in Watford, Hertfordshire, and its National Hub for sorting and processing shipments is also found in the West Midlands. Between April 2013 and March 2014, CollectPlus posted its first full year of profit. For the 52 weeks ending 31 March 2014, the company recorded a profit of £1.8 million and revenues of £34.1 million. CollectPlus also handled approximately 13.6 million parcels over the fiscal year and operated 5,580 sites across the UK. The 2013-14 fiscal year also saw the introduction of larger parcel dimensions and a ‘standard’ 48-hour service for sending parcels. It also saw the launch of Collect+@Westfield, a flagship store that provides shoppers with click-and-collect services at the sprawling West London shopping centre. As a member of the PayPoint Group, most job and career opportunities with CollectPlus are available from PayPoint. PayPoint employs more than 750 people in Europe and North America and seeks individuals with retail, mobile and online expertise. Positions include customer service, IT development and operations, sales and marketing, and finance. Positions with CollectPlus’s head office are based in Watford and include business analysts and client development managers. Employment opportunities are posted on their website. Courier job opportunities are available directly with Yodel, CollectPlus’s parcel delivery service partner. Neighbourhood couriers are based in communities across the United Kingdom. Employment opportunities with Yodel are posted on the dedicted Yodel website. Agents at CollectPlus branches are typically employed by the hosting convenient store, news agent, grocery store or other type of outlet. For more information, telephone CollectPlus on 01923 601616 or 0845 270 9888. Business hours are between 8 a.m. and 8 p.m. Mondays to Fridays and 8 a.m. to 12 p.m. on Saturdays. Calls to CollectPlus’s 0845 number cost 1 pence per minute from a landline and between 20 to 40 pence per minute from mobile phones. Calls to the 01923 number are charged at the standard calling rate. CollectPlus, Victoria House, 40 Clarendon Road, Watford, Hertfordshire, WD17 1HP. Alternatively, enquires may be submitted online using the company’s email form. 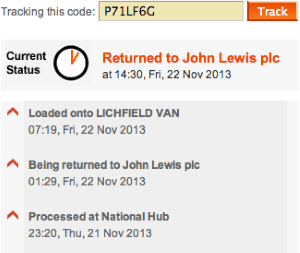 I have received a text to say this parcel has arrived but when I went to pick it up they said it has not arrived. I have been 3 times now to collect. I have been waiting 10 days. i’ll use postman pat in future. Hi i ordered a shirt from you for a present but it was slightly damaged so i returned it .I put a note in it regarding another shirt in its place but i have not received anything back.My tracking number is X675VC8.My daughter has informed me she has sent our old e mail address which is briantoal357@btinternet.com which is no longer in use.Could you get back to me asap. The package is returned to the onlinehop Boohoo.com. It takes usually a few hours until you can track the parcel. Have you tried it several times? Is the tracking number correct? What was the error you encountered? Waiting for collection in my mobility scooter shed. (Rear of garden). We are not able to do this for you. Please contact the merchant.